For all of you parents who are looking for a thought provoking game for yourself or for your kids check out "Wubble". 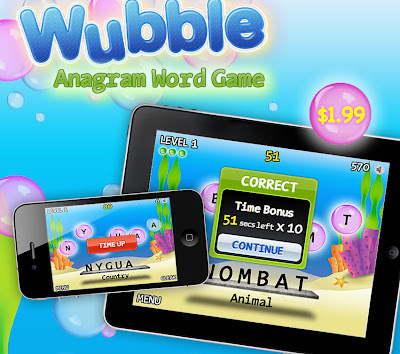 Wubble is an anagram word scramble game created by Garth Humphreys of Gizmoko Games. Garth is a Graphics Designer and Web Developer. His areas of focus are Drupal and Flash. Wubble challenges the gamer with a series of words to unscramble. Wubble is available for easy download and installation via the app store on your iPhone or by visiting the iTunes App Store. This was actually what I was looking for, Great blog post. and I am happy that I finally came here! This for giving out and keep up the excellent work. I will suggest my friends to read this. Looking at data from 15,000 apps organisations distributed to employees’ mobile devices over the last 14 months, we find that 62% are public apps and 38% are custom apps.